Darwyn Cooke's successful run of "Parker" graphic novels recently hit No. 4 with the release of "Slayground." Never heard of Parker? Actor Jason Statham played the character in the 2013 film "Parker," with Jennifer Lopez as did Mel Gibson in 1999's "Payback," although his character went by the name "Porter." The films are fun and get a recommend from this corner. In 1962, Author Donald Westlake created Parker, a career criminal who only steals from those who can afford it and never murders anyone who doesn't deserve it, under the pseudonym Richard Stark. 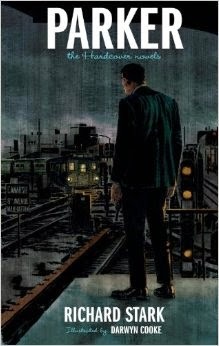 Westlake wrote more than 20 novels about Parker, and Cooke has followed up with a series of beautifully illustrated graphic novels, beginning with "The Hunter" in 2009. Since then, Cooke followed up with "The Outfit" in 2010, "The Score" in 2012 and his most recent effort, "Slayground," released in December 2013. Cooke is the writer and illustrator of the graphic novels, and the style is set in the 1960s. The artwork will win you over with each installment. "Slayground" is shortest of the Coo'e's collection - 97 pages to be exact, and it's the weakest of the four, but considering the strength of the previous three, it's a solid book nonetheless. 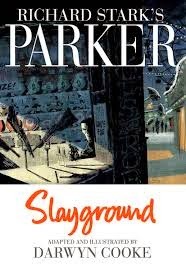 In "Slayground," Parker again finds himself in a bit of mess after a heist goes awry and he finds himself hiding out in an amusement park closed for the winter. Hijinks ensue, and there's never a dull moment with Parker. If you're late following the exploits of "Parker," here's my recommendation: Pick up a copy of "The Hunter" (you won't be disappointed) and mix and match after that. Cooke is releasing an updated version of "The Hunter" with more illustrations on May 27, and plans on continuing Parker's adventures with future graphic novels.